Design by Carlo Zerbaro and Alessandro Trentin, 2006. 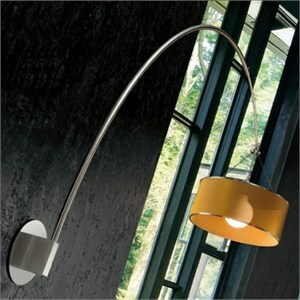 Wall fitting and arm in stainless steel finish. Lampshade in colored stainless steel mesh. Dimensions: Shade 15.75"D X 6.7"H; 43"H; 40" Extension. Uses 1 X 150W 120V medium base globe type incandescent lamp (not included).